It’s starting to slowly get warmer here in the UK so it’s more important than ever to make sure you use SPF on your skin to protect it from skin damage and illnesses. You can do this by using skin care and make-up products that contain SPF and/or by regularly using sun screen. For the former, I have SPF in my moisturiser (REN V-Cense) as well as my foundation (Chanel Vitalumiere Aqua) but have also recently started using a sun screen designed to be specifically on the face. The one I use is by La Roche Posay. It’s really tempting after a long day or night out to get into bed without taking your make-up off or quickly give your face a wash with a wipe but you should remove it properly to stop it from clogging up your pores and transferring onto your pillow. I try to remove my make-up with Emma Hardie Cleansing Balm each night but if I really don’t feel up to it then I will use Bioderma as this removes both eye and face make-up really well. Following this I always moisturise to make sure my skin is hydrated for the following morning when I need to start the routine all over again. Skin Care is something I used to neglect in the past. I literally would just remove my make-up with a wipe (naughty naughty I know but we’ve all done it!) and that was it. I didn’t moisturise, I didn’t use toner, I rarely exfoliated and never used face masks either. Despite this I’ve been really lucky where my skin is concerned because I rarely have break outs and have never suffered with particularly oily or dry skin. It is combination but mostly normal although that does seem to depend on what is going on with the weather. I now have a set skin care routine that I stick to every day and now I can be sure my skin is getting the moisture and nourishment it needs. Take a look at my current skin care routine by watching the video on my You Tube channel. This is a bad beauty habit I am guilty off, especially when I’m at work and it’s something I really need to stop. If you keep touching your face not only does it remove your make-up but also you may be putting bacteria on your face which isn’t good for combating those spots. Some people just love to pick and squeeze spots (ewww) but it’s really not good because it can spread them to other areas, cause infection and possibly cause scarring too so it’s really important you avoid doing this! Rubbing your eyes is not good because not only could you irritate them and remove your make-up but the skin is very sensitive around that area so it needs to be treated with care. I have heard that rubbish your eyes can cause wrinkles too so another good reason to stop! Cleaning your make-up brushes is really important because the build up of product can cause spots and also possibly transfer bacteria onto your face. If your brushes also have lots of product on them your make-up won’t apply as well so you need to clean them regularly whether this be a spot clean or deep clean. Here’s a tutorial on how I do mine. 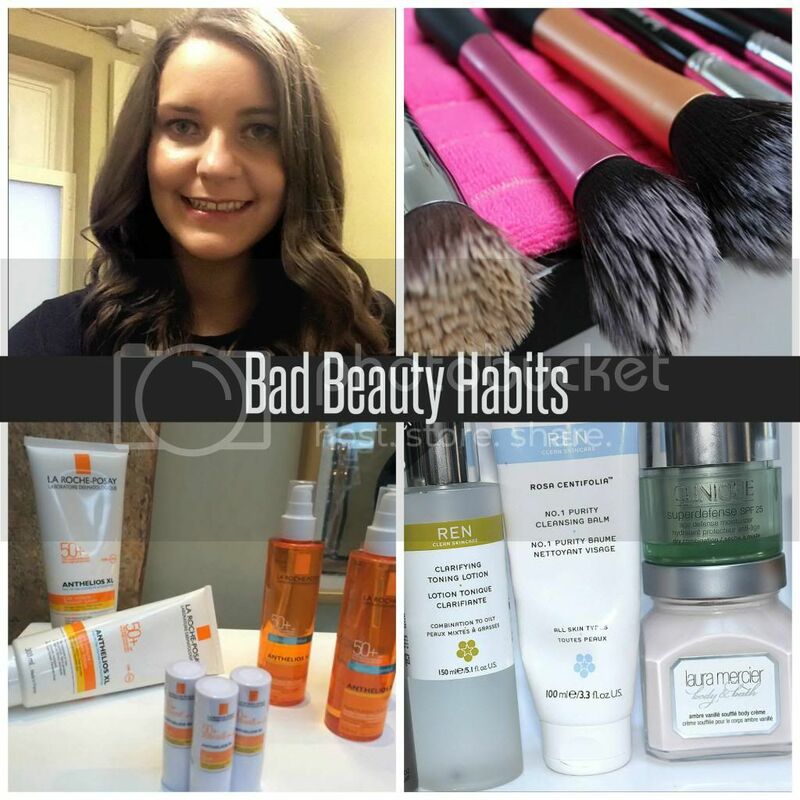 What are you bad beauty habits? 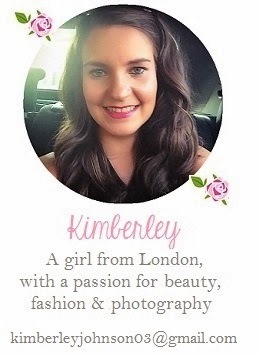 Previous Post Blogging | Cosmo Blog Awards – Vote For Me! I can relate to all of these haha! Is that bad? I am definitely guilty of these, especially when it comes to cleaning my make-up brushes and not using SPF haha! I should definitely use more spf too! Great post lovely! I am guilty of a few of these… oops! Guilty of basically all of these, need to change that haha! Not taking care of my hands/nails. I change up my polish quite often but regularly pay attention to my cuticles or use spf in my hand lotions. I'm guilty of not removing my makeup sometimes before I turn in for the night! Sometimes I'm too lazy to cleanse and I go to bed without taking it off. Although I don't apply heavy makeup like foundations or concealers, and all I do is apply eyeliner, still it's a bad habit, and I need to stop it.